Svetlana Filippova has designed bespoke rugs for her clients for a number of years. It is more in demand as every one is striving to achieve an individual and unique look. Often the rugs are besed on Lana's paintings. They are easily translated in the shapes and sizes required for the job. The types of rugs vary from shaggy piles in wool and linen hand made in Belgium to a combinations of wool, viscose and silk hand tufted in Nepal or Italy. They are in themselves like works of art and would last a life time. The results are trully stunning and objects of admiration by those who appreciate art, design and quality. 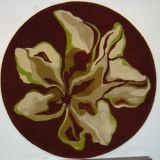 To commission Svetlana to design a rug, contact her to discuss the options.